Jabalpur is situated in Madhya Pradesh occupying the prime centre location of the state.Jabalpur is also popularly known as the city of rocks was named after a sage, Jabalie who did his tapasya in Jabalpur.This place is fully surrounded by rocks and it lies on the banks of river Narmada.Initially it was the capital of the ancient Gond rulers and then of the Kalchuri Kings followed by Marathas and finally into the hands of the British. The location of Jabalpur is 23º10' North latitude and 79º59' East longitude. The city of Jabalpur is located at an altitude of 411 meters. History says that there are references of Jabalpur even in the epic Mahabharatha.In ancient days this place was called by the name Tripuri under the control of Hayahaya rulers. 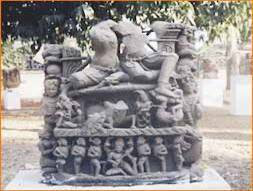 It dwelled as a part of the Mauryan and the Gupta Empires.Jabalpur was the capital of the Kalchuri dynasty before 13th century and during the 13th century it became the capital of Gonds and by 16th century it became a part of the Gondwana kingdom. The legendary Gond Queen Rani Durgavati died fighting the Mughal forces led by the great Mughal Emperor Akbar for Jabalpur.But however in 1789 it was captured by the Marathas. Later the British in 1817 won the Marathas and Jabalpur came under their control, where they made Jabalpur the commission headquarters of the Narmada territories and established a cantonment here. This festival falls in the month of August.Gond dance festival is associated with fertility. Some other very popular dance forms of the city are Matki, Giridaand and Phulpati dance forms. These dance forms are mainly performed by the nomadic ethnic groups called Banjaras and Kanjars. is dedicated to Goddess Durga.It is situated on a hillock from where you can get a beautiful view of the river Narmada.The main feature of this temple includes the carved stone figures of deities belonging to the Kalchuri period.There is also an underground passage connecting Chausat Yogini temple and Gond Queen Durgavati's palace. Tripur Sundari Temple - This temple is situated at a distance of about 12kms from the city in a village named Tewar. Pisanhari ki Madiya - This is one of the famous Jain temple in Jabalpur dedicated to the service of a poor woman who embarked upon the construction of these clump Jain temples.Pisanhari ki Madiya is situated near the Netaji Subhash Chandra Bose Medical College. Vishnu Barha Mandir - This temple is dedicated to Lord Vishnu and is situated in a place called Sihora Tehsil of Jabalpur. This fort was built by the Gond kings in 1116.You get a beautiful view of the city and the countryside from this fort. This place still has the remains of the Madan Mahal Fort. These buildings belong to the ancient kingdom of the famous Gond King, Sangram Shah. The period took for construction of this is from 1480 to 1540.Adjacent to this building is the Sangram Sagar Lake which has aquatic birds like red crested pochards, coots and pin-tailed ducks as its dwelling. 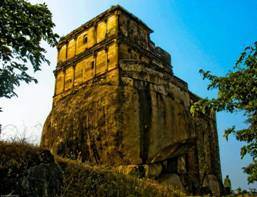 This place which attracts a major tourist crowd is located at a distance of about 15 km from Jabalpur. Rani Durgavati Memorial and Museum is a treasure house of ancient relics and sculptures. It also houses old idols of Gods and Goddesses belonging to the 10th century. The museum also has a collection of things related to life of Mahatma Gandhi. This museum was built in 1964, to commemorate Queen Durgavati. 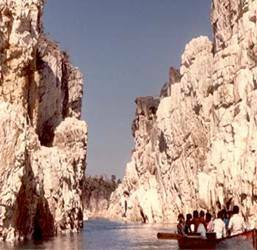 The world famous marble rocks on the banks of river Narmada are located in a place called Bhedaghat at a distance of about 21kms from the city. These rocks goes upto a height of about 100 ft. It is beautiful to look at these huge rocks both in the sunlight and moonlight. The Dhuandhar Fall which is also popularly known as smoke cascade is situated at a distance of about 23km from Jabalpur from where the Narmada river plunges through a narrow chaam. Located 12 km from the Jabalpur Railway Station, Tilwara Ghat is one of the places from where Mahatma Gandhi's ashes were immersed. It sites on the holy bank of the Narmada and is famous for being the venue of the open session of the Tripuri Congress in 1939. 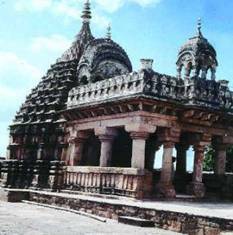 An ancient Mahadev temple (Tilwadeshwar) is located here and draws many visitors to the place. Some of its nearby attractions include Mala Devi Mandir, Pariyat Tank, Bargi Dam, Lamheta Ghat and Roopnath Lingam. Nohta was the capital of Chandela kings and is situated at a distance of about 81 km from Jabalpur.The important feature of this place is a Shiva temple where an annual Kartik fair is held. You can also get to see a few Jain ruins in the nearby places. Mandla is located at a distance of about 95kms from the city.The main feature of this place is the fort which was once very magnificent but however today it is getting into ruins with just few of its towers standing out.There are number of ancient temples in Mandla on the river banks. Ramnagar was very famous for its fort which was built by Gond kings.The main feature of this fort is its three- storey construction. This place is located at a distance of about 15 km away from Jabalpur. 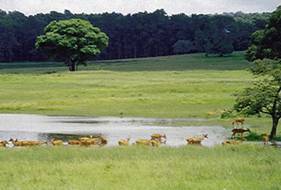 This is a wildlife sanctuary close to the Pench National Park at a distance of about 101 km from Nagpur. The prominent feature of this sanctuary is the bison which attracts a major tourist crowd. 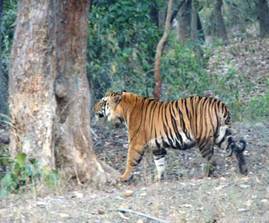 This is one of the finest parks of India.Kanha is a home of large variety of wildlife such as panther,tiger,sambar,cheetal,gour,black buck,barking deer,barasingha and many others. There are dense forests with bamboos on the mountain slopes and the stately sal groves interpersed with rolling meadows in the valleys. Jabalpur is famous for stuffed toys, jute crafts, silver and brassware and a range of saris and dress materials with exquisite zardosi embroidery.The traditional Maheshwari and Chanderi saris of this state are also avilable in almost all the textile outlets.All these stuffs are more concentrated in the old bazaar of Jabalpur.Mriganayani is the government emporium known for souvenirs and jute crafts. The main bus junction in Jabalpur is located west of Napier town. Jabalpur is on the National Highway 7 and is well connected by bus with Bhopal, which is about 8 hrs away, Indore, Satna, Raipur and Nagpur.There are regular government and private bus services to Bhopal. How to Reach Jabalpur by Air – Jabalpur has an airport called Dumna which is situated at a distance of 20 kms from the main city centre. It is connected to all the important airports in India. Bi-weekly (IA- Boeing ) is available to Delhi and Raipur. Jabalpur railway station is located north of the Civil Lines Area. It is connected with all the metros and the major cities in India. It has direct trains to Satna (189 km, 3 hours), Varanasi (505 km, 13 hours) and Bhopal (336 km, 7½ hours).